I just want to pinch his cheeks. 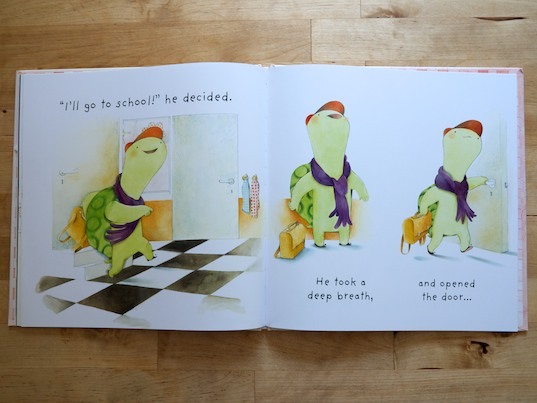 There are tons of fabulous, classic back-to-school picture books in the world, but my favorite of recent years is Lucy M. George and Merel Eyckerman’s Back to School Tortoise. Rotund and baseball-capped Tortoise is so nervous about the first day of school! Kids can be mean, tortoises can be clumsy, times are tough. But this intrepid Tortoise is bucking up. He’s brave, he’s cheerful, he’s ready to learn, and so…! 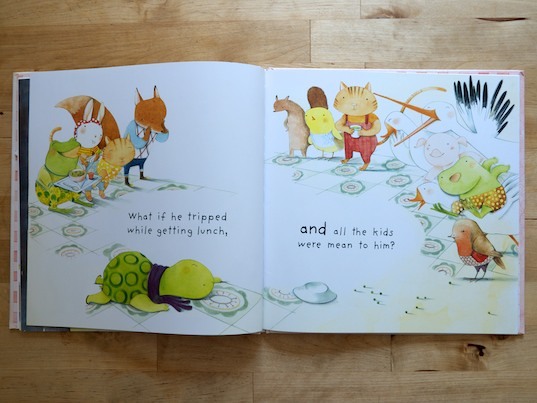 But there’s a twist ending to this little story… Tortoise is the teacher! So it kind of bugs me when people talk about how adorable kids’ books are because I take myself too seriously, but come on. Look at this and tell me it isn’t the cutest damn thing you’ve ever seen in your life. This entry was posted in Uncategorized and tagged back to school tortoise, lucy m. george, merel eyckerman, Nicola's Books, picture books, school, September 2014. Bookmark the permalink.